Cherokee DNA Studies will now be on Audible. 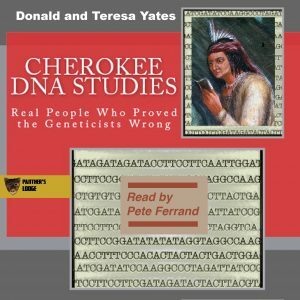 Panther’s Lodge is producing an audiobook version of its title Cherokee DNA Studies: Real People Who Proved the Geneticists Wrong, by Donald N. Yates and Teresa A. Yates, principal officers of DNA Consultants. The title, which was the first in the series DNA Consultants Series on Consumer Genetics, appeared in print and on Kindle in December 2014. The audiobook version is an abridgment narrated by veteran broadcasting teacher Pete Ferrand and should be available on Audible by the holiday season. Cherokee DNA Studies told the stories of more than a hundred participants in the company’s first two phases of a research study finding unusual East Mediterranean mitochondrial types among the “standard” American Indian founding lineages in Cherokee descendants. Its DNA findings pointing to Egypt, the Levant and North Africa were heralded as “revolutionary” by Stephen C. Jett in a chapter of his book Atlantic Ocean Crossings: Reconsidering the Case for Contacts with the Pre-Columbian Americas (University of Alabama Press, 2017). Phase III of the same study was closed in May. Those results will be published in a follow-up volume subtitled More Real People Who Proved the Geneticists Wrong. Donald Yates, who also publishes as Donald N. Panther-Yates, has written or co-written some twenty-three books and has sixteen works on Audible. His latest two audiobooks were The Cherokee Origin Narrative, narrated by Jacob Phillips, and On the Trail of Europa: Travels through Italy, Croatia, Greece and Turkey, read by Jim D. Johnston, both released this fall. A bonus in this trailer and the audiobook itself is a sample of authentic spoken Cherokee by language instructor Brian Wilkes.